The Organic Lice Guru Lice Prevention Kit is the #1 Organic Lice Prevention product line in the USA. Pediatrician formulated with organic ingredients and guaranteed to work. Lice-Free Kids Are Happy Kids! Our Organic Lice Prevention & Lice Treatment Products Are Entirely Non-Toxic & Safe For Kids Of All Ages! Q. Does Your Lice Treatment Kit REALLY Get Rid of Lice? A. YES! The Organic Lice Guru Lice Treatment Kit will get rid of lice and nits in one day. We stand behind the Organic Lice Guru Lice Treatment Kit with a full money back guarantee. Q Does Your Lice Treatment Kit Get rid of Nits? A. Yes, but it isn’t abnormal that in some cases there may be a few nits that do not rinse out with the treatment shampoo. This is why we provide our 100% effective nit removal comb. After using the Organic Lice Guru Lice Treatment Conditioner, separate the hair into sections and use the Organic Lice Guru nit comb to remove any remaining nits. Q. How Long Can Head Lice Live On a Human Head? A. Head lice can survive on a human host for about 30 days. They can live for up to 72 hours off of the host. A female louse lays 3-5 eggs a day. The eggs hatch in 7-10 days and it takes another 7-10 days for the louse to mature and lay their own eggs. A. Head lice are spread through contact. Children playing together in a playground bump heads and come in close contact with one another. Sharing hats, combs, and brushes can also spread head lice. Lice do not fly or jump, but they get from one host to another by crawling quickly. Q. Do OTC Lice Remedies Get Rid of Lice? A. Yes and No, but the effects are negative even if you temporarily get rid of your lice. Due to resistances built up over the years by lice to the chemicals in OTC lice treatments, studies show lice are now mostly impervious to these treatments. On top of that studies show that the chemicals in OTC treatments are linked to behavioral problems in small children. On top of that OTC treatments only kill the bugs, not the nits, so in a week or 2 there is a fresh crop of chemical-resistant lice infesting your scalp. All in all these are dangerous and a waste of time and money! Q. Do Home Remedies Get Rid of Lice? A. No! Mayonnaise and Vaseline are used to smother lice. The problem with this is that you have to leave this on the head for hours which is difficult with young children. You might smother some of the adult lice, but it will not kill the nits. Also, you are not treating lice in your environment (sofa, pillows, rugs. linens etc…). The head lice will be back in 7-10 days once the new eggs hatch, and your head lice infestation will be worse. Q. Should I Hire Your Professional Lice Removal & Nit Picking Service to Come Out to My House? A. When you use the Organic Lice Guru Lice Treatment & Lice Prevention system, there will not be any nits left alive. The few nits that may remain will comb out with ease, after using Organic Lice Guru Lice Treatment Conditioner. Once you use Organic Lice Guru household spray in your home and wash your linens and clothes with Organic Lice Guru laundry additive, you will be 100% lice free. There is not a specific need to hire our nit picking service after treating your family yourself with the Organic Lice Guru Lice Treatment Kit, however some families still choose to hire a professional because they realize that the time it takes to treat the lice infestation has value for them in other ways. The complete Organic Lice Guru Lice Treatment package will leave you 100% Lice-Free for 30 Days, Guaranteed! Please read instructions carefully prior to using our organic lice treatment products. 4. Repeat steps 1, 2, 3. 5. Wait 20 minutes this time. 8. Lather hair completely with Organic Lice Guru Lice Treatment Shampoo, making sure to get around ears & neck. 9. Secure shower cap (included with kit) and wait 40 minutes. 10. Rinse hair and shower cap with warm water until all traces of shampoo are gone. 12. Wait for 20 minutes this time instead of 40 minutes. 13. Massage conditioner onto hair as well as the scalp, for 5 minutes. 12. Use normal hair comb to detangle and separate hair into small sections, then use lice comb from scalp to the end of the hair, wiping on paper towel after each pass. 13. Continue on each section until several ‘wipes’ show no sign of lice, eggs & nits. 1. Gather all of your washable items that came in contact with head lice infested individuals. 2. Add 1 oz laundry additive to small loads and 2 oz to large loads with your regular detergent. 3. Put your clean washable items in your dryer on the hot setting for at least 45 minutes. 4. Stuffed animals, plush toys, hats and soft hair accessories that have come in contact with lice and are not washing machine safe should be placed in bags and put outside of the home for 14 days. You do not need to treat plastic toys. 5. Clothing or bedding that has come in contact with lice and is not washing machine safe should be placed in bags & put outside of the home for 14 days. 6. Do not add laundry additive to steam cleaners. Laundry additive should only be added to your washing machine. 1. Lightly mist furniture, throw pillows and car interior with household spray. 2. Lightly mist carpets and area rugs with household spray. Let it sit for 5 minutes. 3. After 5 minutes time, vacuum all carpets and area rugs that were misted with household spray. -Overnight which will arrive at the end of the day on the next business day.2 Day Air will arrive in 2 business days. Customers are responsible for any taxes, duties, or fees your country may charge. ClearLice only charges the customer the rate UPS charges to deliver the package. UPS International Priority Will arrive in 2-3 business days (Not available in Certain Countries)When will your order ship? All orders received by 3:30 pm EST will ship the same day. All orders received after 3:30 pm EST will ship the next day. Although delays are very rare, Organic Lice Guru cannot be held responsible for shipping delays due to weather or circumstances out of our control. If UPS does not deliver your express package on the specified delivery date, it will be your responsibility to contact UPS. We use UPS because they are extremely reliable and have great rates. You will receive a tracking number to your email address as soon as your order is processed. You will be able to track your order. If you would like to cancel your order, please call our Customer Service department at 1-213-BYE-LICE. If you cancel your order before it is shipped, we will gladly refund your entire order including the shipping. If you cancel your order after it has been shipped, it is up to the customer to send the package back, or refuse the package. Once the package is returned, a full refund will be issued, less shipping costs. We will be charged for the package, because it was shipped. You must call and notify us that you are refusing or sending the package back. Once we receive the package, all cancellation refunds are processed. We reserve the right to cancel any order at any time. If you are not totally satisfied after using our product according to the directions inserted in your kit, you must return the used and unused bottles and comb (in a sealed plastic bag) for a refund. Be sure you return the complete order for a full refund. ONLY Organic Lice Guru Treatment products are Guaranteed. If you purchase Organic Lice Guru Treatment products then you are eligible for a refund. Organic Lice Guru Prevention products are NOT guaranteed. If you purchase Organic Lice Guru Prevention products, you are NOT eligible for a refund. You have 30 days from when your product was shipped to request a Return Authorization Number for a refund. We do not issue Return Authorization numbers past this 30 day period. We DO NOT refund the cost of shipping. If a package is refused we will deduct the cost of shipping from your refund amount. Call our Customer Service Department at 1-213-BYE-LICE between 9:30 am to 5:30 pm PST Monday to Friday to receive your Return Authorization Number. Display this number visibly on the outside of the return package. Packages sent to us without a visible Return Authorization Number will not be accepted and will be discarded. If we do not receive your return package within 21 days of issuing the Return Authorization number, your purchase will no longer be eligible for a refund. We strongly recommend returning packages to us through certified mail with a tracking number. If we do not receive your product, and you cannot prove your product was returned, we will not issue a refund. Returns will be processed and refunds issued within 14 business days of return package receipt. Refunds will be issued in the same form as the original purchase payment method. If this payment method is closed for any reason, we will issue a company check for payment. Thank you in advance for your understanding. Your continued support helps us to pass savings on to you, our valued customer. We ship to all 50 states in the US via Federal Express. Shipping is calculated on the basis of product weight and customer location. International Customers are responsible for any taxes or duties their country charges. At Organic Lice Guru, credit card security is one of our top priorities, and that is why we guarantee 100% secure ordering for all of our customers. To protect you and your credit card information, Organic Lice Guru uses technologies and policies such as limited access data-centers, firewall technology; secure socket layer certificate authentication and limitations of administrative access to our systems. In addition, it is our policy not to send your credit card number via e-mail. In fact, this is a practice we encourage you to adopt in all of your Internet activities. b. This license shall automatically terminate if you violate any of these restrictions and may be terminated by Organic Lice Guru at any time. Upon terminating your viewing of these materials or upon the termination of this license, you must destroy any downloaded materials in your possession whether in electronic or printed format. a. The materials on this web site are provided “as is”. We makes no warranties, expressed or implied, and hereby disclaims and negates all other warranties, including without limitation, implied warranties or conditions of merchantability, fitness for a particular purpose, or non-infringement of intellectual property or other violation of rights. Further, Organic Lice Guru does not warrant or make any representations concerning the accuracy, likely results, or reliability of the use of the materials on its Internet web site or otherwise relating to such materials or on any sites linked to this site. In no event shall Organic Lice Guru or its suppliers be liable for any damages (including, without limitation, damages for loss of data or profit, or due to business interruption,) arising out of the use or inability to use the materials on Organic Lice Guru’s Internet site, even if Organic Lice Guru or an Organic Lice Guru authorized representative has been notified orally or in writing of the possibility of such damage. Because some jurisdictions do not allow limitations on implied warranties, or limitations of liability for consequential or incidental damages, these limitations may not apply to you. The materials appearing on this web site could include technical, typographical, or photographic errors. Organic Lice Gurudoes not warrant that any of the materials on its web site are accurate, complete, or current. Organic Lice Guru may make changes to the materials contained on its web site at any time without notice. Organic Lice Guru does not, however, make any commitment to update the materials. 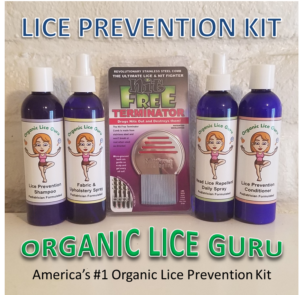 Organic Lice Guru has not reviewed all of the sites linked to its Internet web site and is not responsible for the contents of any such linked site. The inclusion of any link does not imply endorsement of the site. Use of any such linked web site is at the user’s own risk. Any claim relating to this web site shall be governed by the laws of the State of Florida without regard to its conflict of law provisions.